Based on David Kessler’s newest book, You Can Heal Your Heart, co-authored with the legendary Louise Hay, this recording is a blend of Louise’s life-changing thought processes as well as David’s years of working with those in grief. Their message will inform you and inspire an extraordinary new way of thinking and treating your clients. David Kessler, best-selling author, collaborator with the groundbreaking Elisabeth Kübler-Ross, will provide you with the newest information on healing all kinds of grief. 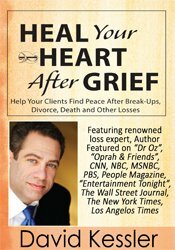 Teach your clients how to tackle the grief that occurs when a relationship leaves them brokenhearted, a marriage ends in divorce, a job is lost, dealing with cancer, a death occurs, or other challenging life circumstances. Enhance your work as a clinician with clients who have dealt with loss. 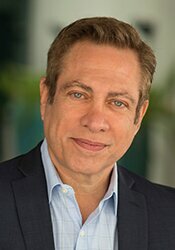 David’ message will fill you with insight, tools, strategies, and inspiring information. Utilize grief coping strategies to improve client level of functioning. Discuss clinical strategies to reduce feelings of betrayal in clients. Outline the stages of grief to inform the clinician’s choice of treatment interventions. Recognize the clinical implications of grief on children and adolescents. Communicate disaster and crime coping techniques to improve client level of functioning. Analyze effective and ineffective models for family coping and integration as it relates to treatment outcomes. How much information is good to share? The possibility of a sixth stage? Vermont Counselors: This program is approved by the Board of Allied Mental Health Practitioners (BAMHP) for 6.0 continuing education credits.